In mourning over the death of a friend and ally, Harry Potter (Daniel Radcliffe), Hermione Granger (Emma Watson) and Ron Weasley (Rupert Grint) steel their resolve as they prepare for the final stage of their long fight against Lord Voldemort (Ralph Fiennes) and his hordes of Death Eaters. They now know that in order to defeat Voldemort, they must destroy all of the Horcruxes - magical objects into which Voldemort has imbued part of his soul - in order to render him mortal. 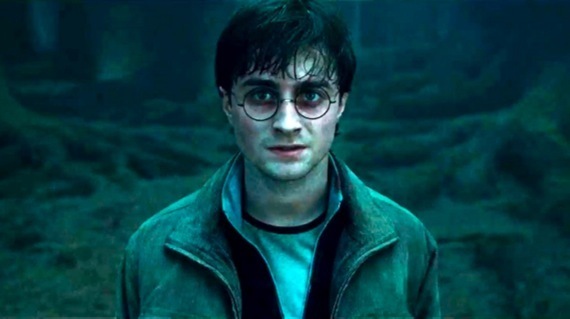 Unsure of what the Horcruxes actually are, they set about discovering where they are hidden and ways to destroy them, always trying to stay one step ahead of their enemies, even as they are inexorably drawn back to Hogwarts School of Witchcraft and Wizard, where their journey began, and where it must now end. Harry Potter and the Deathly Hallows Part One was fairly heavily criticised - at least in comparison to the rest of the films in the series - for its slow, deliberately ponderous pace, as the decision to split the seventh and final book in J.K. Rowling's magnum opus meant that, by design, the majority of the action and resolution would be in the second film, whilst the first would have to consist largely of three characters sitting in a tent being moody. Whilst I personally felt that series writer Steve Kloves and latter-day series director David Yates managed to make the best film they could out of the material, one which did a wonderful job of getting the characters to the point where they could take their final step, whilst also delivering plenty of small moments and big action setpieces to please the fans, I can't legitimately argue that Part One is a complete, satisfying film. For all the caveats and mitigating circumstances I can throw up in defense of it, it simply isn't a story in its own right, but merely the first half of a larger one. As such, it's easy to see why many people were frustrated with Part One, since it's a long, slow film in which a few key plot elements are moved into place for a finale which was still a whole other film away. It's a lot of place setting when everyone just wants to get down to the main course. Part Two could not stand in starker contrast, then, since apart from a contemplative and brooding opening showing the aftermath of Dobby's death, it jumps straight into the action with a thrilling raid on Gringott's bank, then rarely lets up as the story hurtles towards its natural conclusion; the truly magnificent spectacle that is The Battle of Hogwarts, in which hundreds of good and bad wizards, as well as trolls and stone statues brought to life, fight to the death, forming the backdrop to the final duel between Harry and Voldemort. Most of the Harry Potter films have felt fairly parochial in their scope. There's a quaintness to the ways in which the stories were so confined to Hogwarts, and how the grander story of evil slowly engulfing the world could be pushed into the background in favour of Potions lessons and schoolyard crushes. That balance gave the films a lot of their charm, but it also made them feel incredibly slight when compared to The Lord of the Rings trilogy, which ran concurrently with the first three Potter films and always seemed to dwarf them thanks to their epic scale and grandeur. Freed of those restrictions - our heroes are fugitives, not students - the film is able to rise to the occasion and deliver action sequences befitting the end of a saga. The Battle of Hogwarts is grand and chaotic, with hundreds of small battles going on at once. Yates finds time to focus on individual fights, particularly those involving series dunce-turned-hero Neville Longbottom (Matthew Lewis) and regulars like Remus Lupin (David Thewlis), Professor MacGonagall (Maggie Smith) and the Weasley Twins (James and Oliver Phelps), who continue their tradition of injecting humour and humanity into the darkest of circumstances, or being distractingly annoying, depending to where you stand with regards to them as characters. The whole film has a valedictory air to it, as not only do the familiar faces show up, but actors who haven't been in the films for years do too, sometimes for only one scene at a time, as in the case of Emma Thompson's Professor Trelawney. It makes the film seem a little bit cramped, as if they tried to cram in as many cameos as possible, but there's also something comforting about it. Everyone involved in making Harry Potter and the Deathly Hallows Part Two would have been acutely aware that this was the last hurrah of a series beloved by millions, and there's something right about these actors returning to play these characters just once more, even if they don't get to say anything. Of tthe actors who do get to speak, they acquit themselves well, with some shining brighter than others. With all their issues and insecurities covered fairly comprehensively in the last film, saying nothing of the six before that, Radcliffe, Watson and Grint play their characters as fairly pure, uncomplicated hero types, which suits the story but does make them less interesting, even if they do get to play big, important moments like Ron and Hermione's first kiss or Harry realising just what it will cost to defeat Voldemort. The best performances in the film lie with the villains, though. Ralph Fiennes has a lot of fun with Voldemort, adding fear and desperation to his usual menace as he realises that someone knows about the Horcruxes and is trying to destroy them, whilst Jason Isaacs and Tom Felton get to imbue their formerly united father and son team of Lucius and Draco Malfoy with a deal of conflict and panic only hinted at before. The most important performance in the film, though, is given by Alan Rickman as Severus Snape. Having been an antagonist since the beginning - a position accentuated by his involvement in the death of Albus Dumbledore (Michael Gambon) - he gets a moment of redemption that is one of the most moving of the series. The montage that reveals everything about Snapes's true self is a bit compressed and rushed, but that only adds to its power as the revelations are more overwhelming, at least for anyone who hasn't read the books and might not know what is going on. It's a very well-handled ending for a character who has been one of the consistent highlights of the series. That's not something that can be said about every aspect of the film, though. There are problems with it, chief amongst them being the epilogue, which looks ridiculous considering the amount of money available that could have been used on decent make up and effects. Furthermore, some fairly major characters die, but their deaths either happen incredibly quickly or off-screen entirely, meaning that they lack the impact and resonance befitting the characters. That these problems can also be found in the book does not excuse them, since Yates and Kloves could have solved them, rather than taking the book's flaws and putting them on-screen. However, for me, those flaws don't really enter into the equation. As a fan of the series, I'm far happier that it handled the rest of the story so well, that it managed to stick the landing and deliver a finale that is grand, epic and is a sufficient pay off for ten years and eight films of storytelling, yet which kept the same feel of the rest of the series. The Harry Potter films have always had a sense of wonder to them that is rare in blockbuster cinema these days. There is something genuinely magical about them, and even the weakest films in the series have that sense of the otherwordly to them. As someone for whom the Harry Potter series is genuinely important, because of the age at which I read the books, I felt that the film delivered an ending that was fitting. Maybe not perfect, maybe not the best ending they could have had, but fitting. A fine finish, and I already miss the feeling of looking forward to the next one.